Tart Shell: Combine flour, sugar, butter slices and egg in mixer with paddle attachment or pulse in food processor with kneading blade. Do not mix for more than about 30 seconds. Wrap the pastry in plastic wrap and chill for 30 minutes. Turn pastry onto a floured surface and shape into a flat round disk. Place into a greased and floured 10-inch tart pan. Prick the dough thoroughly and bake for 15–20 minutes in the preheated oven (400° F) until lightly browned. Filling: Grate and squeeze limes for ½ cup fresh juice and grated zest. Place cottage cheese, sugar and grated lime zest in food processor and process until creamy. Heat the lime juice and add gelatin. Stir to dissolve. Add to cheese mixture. Whip cream and fold into to cheese mixture. Fold in partially thawed Wild Blueberries. 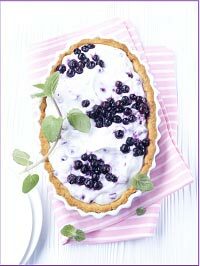 Spread the Wild Blueberry Chiffon on the tart shell and refrigerate for about 2 hours. Wash and dry the mint and decorate the tart with the leaves. Serves 12.